In 17th century New England, a Native American boy called Caleb from what would later be known as Martha’s Vineyard would become one of Harvard’s earliest students. This book imagines his story, seen through the eyes of an imagined dear friend Bethia, using as much primary sources as were available to create the story of the boy’s remarkable life. Way back in the annals of Harvard history, the students at the school were the sons of landowners who hoped to join the clergy, and the children of Native American populations whose places were funded by donations from England, who wanted to see the “savages” converted to Christianity. Apparently some of the funds given for education of Native Americans was misappropriated, if you can imagine. And as wars increasingly broke out between local tribes and settlers, the places for native peoples were abolished, but these funds appear to have been instrumental in the creation and establishment of Harvard. I sped through this book. I really enjoyed reading about the habits and social context of the time, as well as descriptions about the lives and locality of the island. The author lovingly reproduces the sights and sounds of the place, and has a great deal of insight into the native population as well as the English. 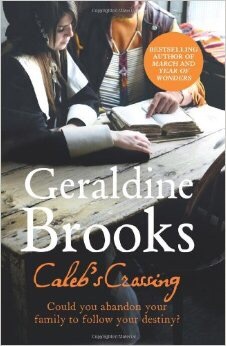 It’s odd, perhaps, to read about the boy, Caleb’s, life through the eyes of someone else, the girl Bethia. It’s an unusual way to write a biography, and yet as the author creates a delightful character in her protagonist, and factoring in that the author is white and female, perhaps it shows the right kind of delicacy in telling the story of a Native American boy. Most importantly, it’s fascinating to read about the social implications of being female or a native in the past, what was accessible and what was forever out of reach. And I feel Caleb’s story is both incredible and deserves to be told and celebrated. A highly entertaining read, this one comes recommended. Read It If: You like New England history, Native American stories or tales that are a little unusual.